Hello my lovelies, how are you all today? I hope you're having a brilliant day! Once again i've been the most neglectful blogger I know, I haven't posted anything on here in weeks, but it's been a busy time and i'm also incredibly lazy! SO SORRY! But i'm here now so let's crack on with it shall we?! So it's that time of year again, whether or not you celebrate it in any way shape or form you'll no doubt still be aware that today is Hop-Tu-Naa (or Halloween if you're not from the Isle of Man) which means trick or treating, turnips (or pumpkins), dressing up in fun costumes and gathering ginormous heaps of SWEETIES! 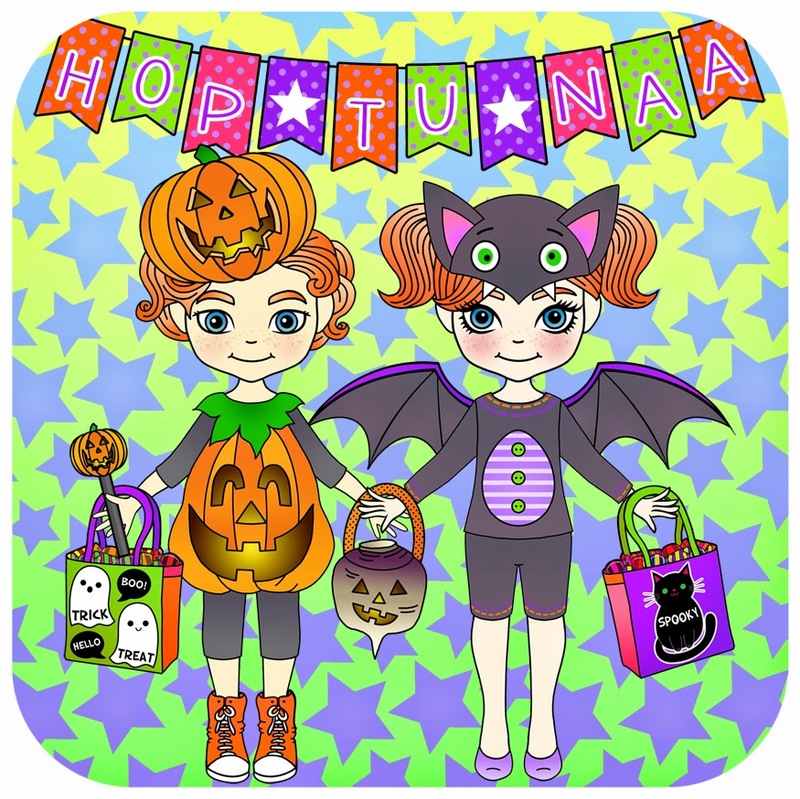 I mean just ask Aalish and Illiam, they know all about trick or treating and they just LOVE Hop-Tu-Naa! 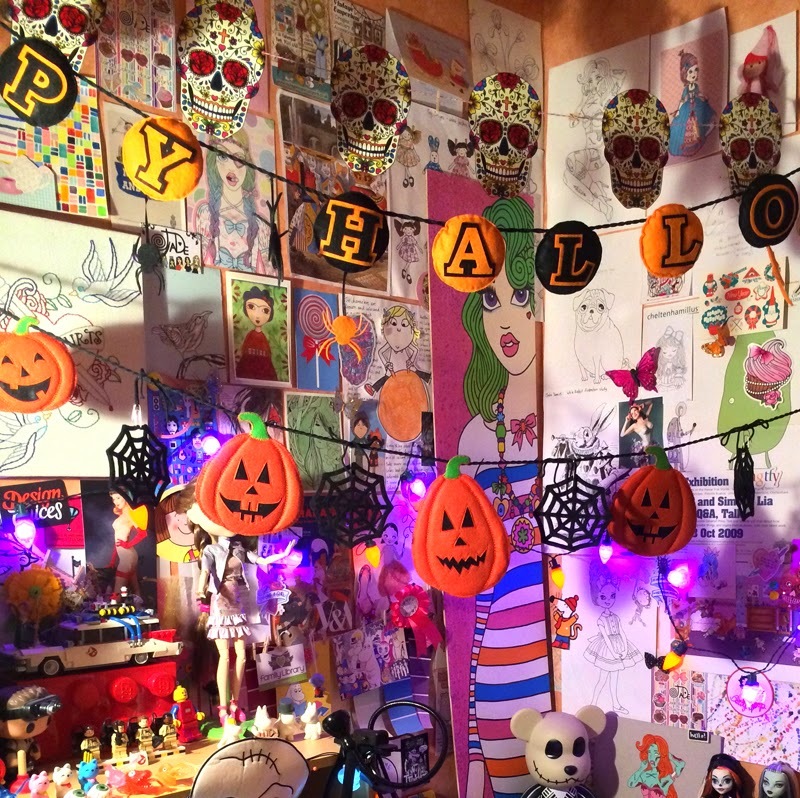 you might be thinking, 'Jade what do you mean you decorated your desk for Halloween, are you insane?!' in which case the answer is a most definite and resounding YES! Yeah so I was (attempting to do some) tidying up and I found a bag full of Halloween decorations that I didn't even realise I had! So I kind of HAD to put them all up. 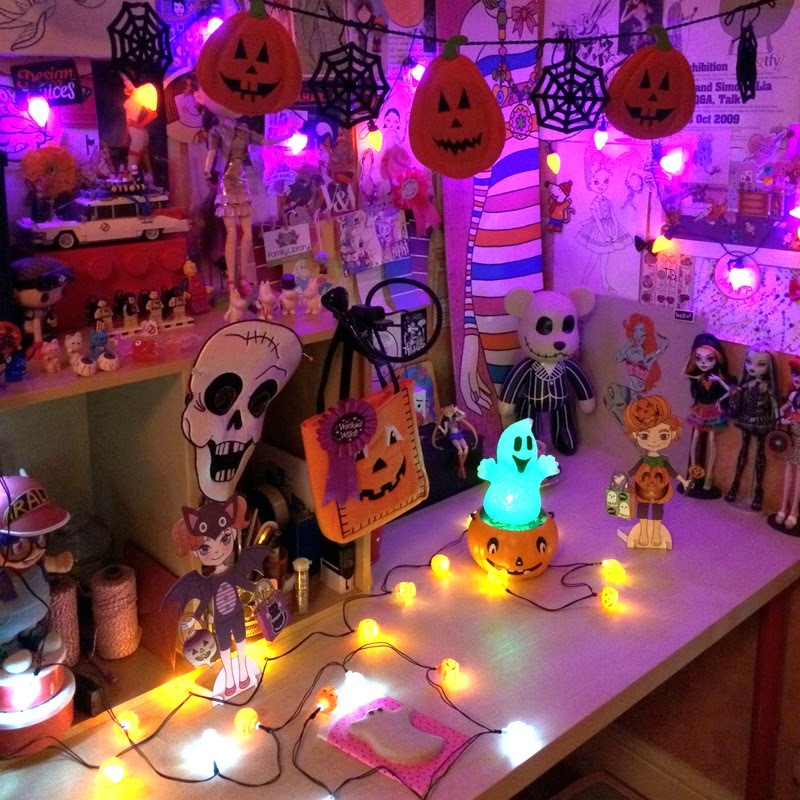 I mean I have mini spooky fairy lights and pumpkin garlands and ghost gingerbread!!! 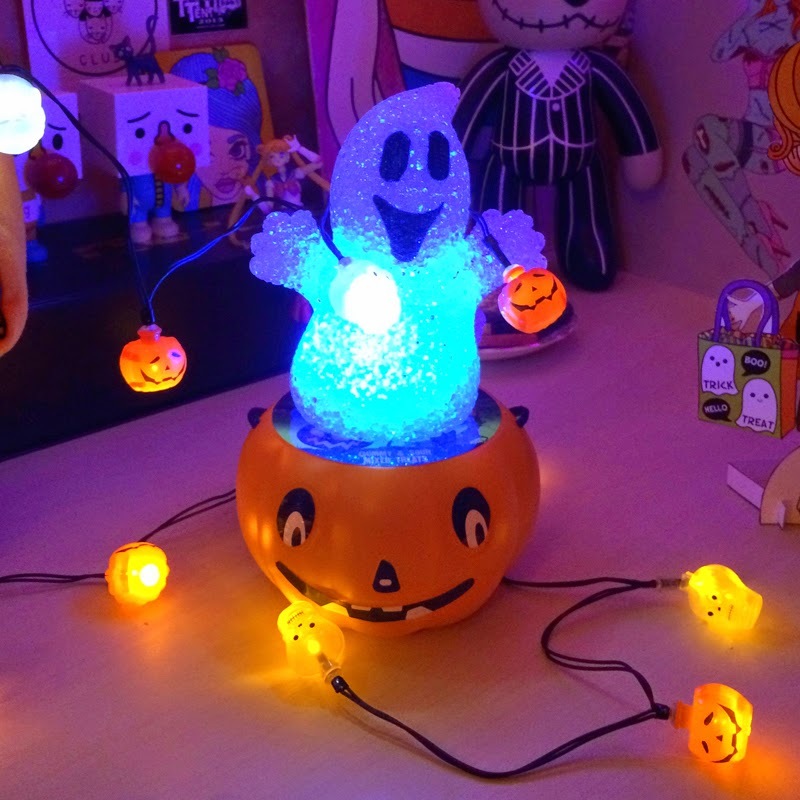 LOOK AT THIS SPARKLY COLOUR CHANGING GHOST LIGHT!!! oh but that's not all, you see I also dressed up this year! And then naturally I dressed up as a Ghostbuster, because come on it's ME and really what did you expect?! WHO YA GONNA CALL?! well not me, obviously! I'm not actually leaving the house tonight as it is utterly vile weather outside, but that doesn't mean I can't still dress up right?! I'm going to stay in and watch 3 or 4 different versions of Frankenstein and consume my body weight in butter popcorn! 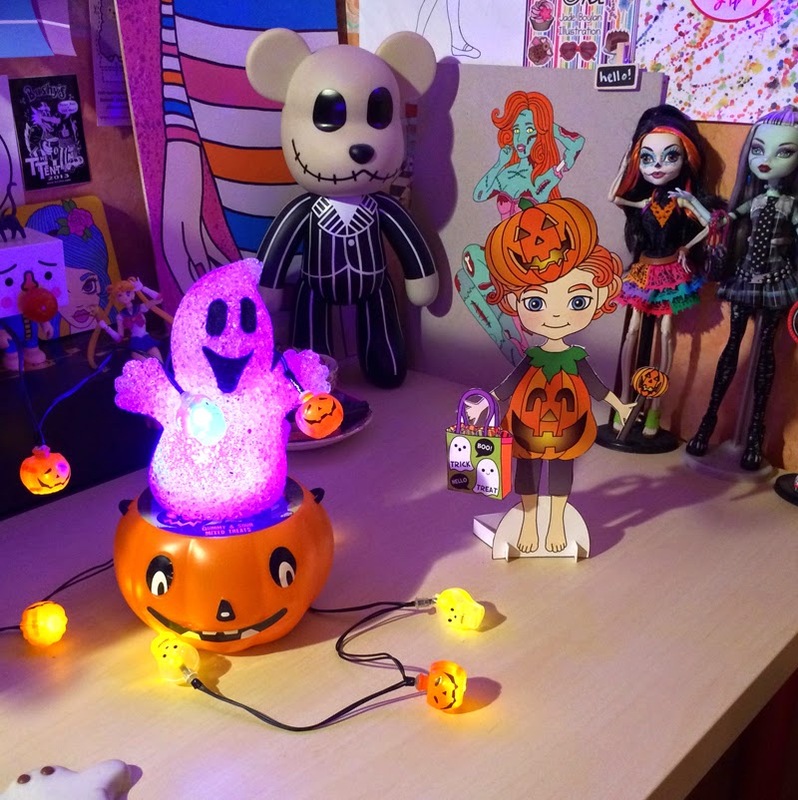 you might have spotted Aalish and Illiam as part of the decorations on my desk, both in their fave spooktacular costumes. Ah but they aren't the only ones up to spooky Halloween shenanigans this year! 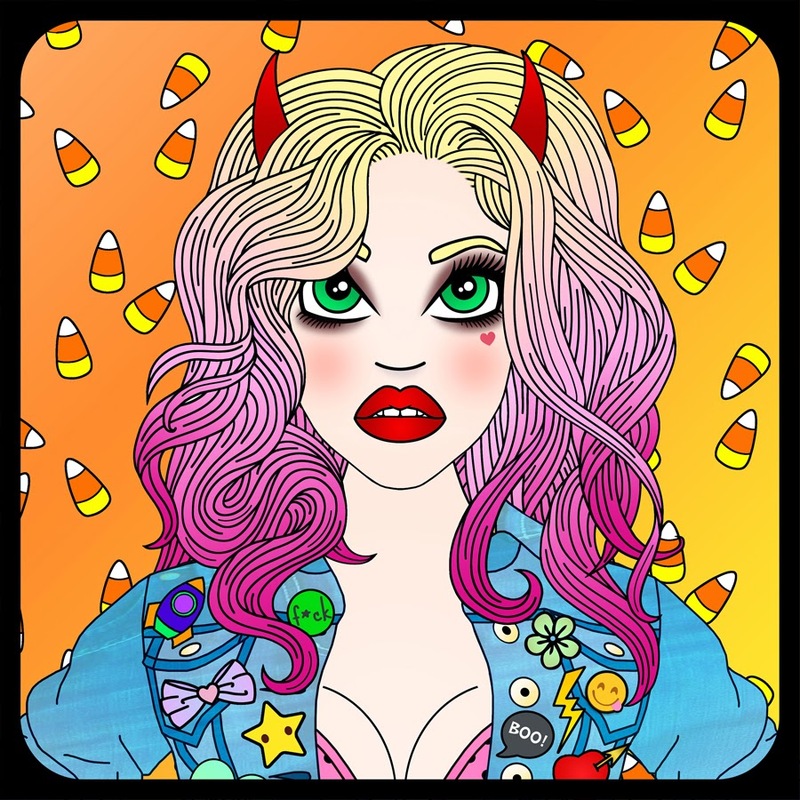 As has become tradition over the past few years, this October I decided to have a go at a special Halloween themed illustration and this year I thought it might be fun to design a Candy Doll. Only this time I came up with two instead of one! 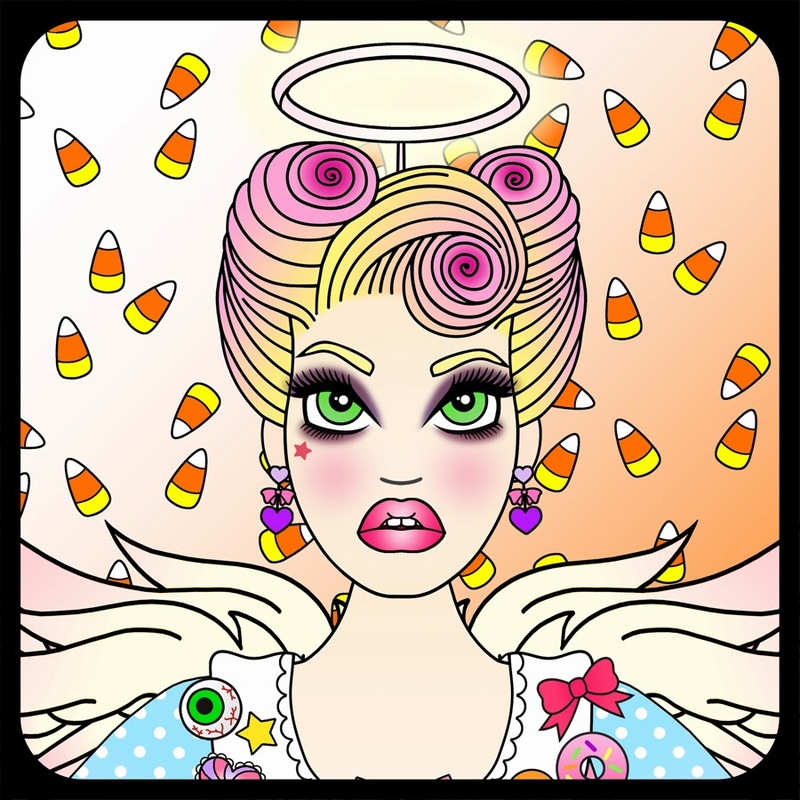 I started out by drawing a girly candy doll but as I gave her the angel wings I thought 'hhm maybe I should draw a Devil girl as well!' so... I did. oh alright i'll make it easy for you, technically this is Trick... hence the Devil horns and tail + killer red lipstick! so I suppose this is Treat... but don't let the halo and wings fool you, that doesn't necessarily mean she's that much of an angel! I guess they're kind of twins, or at least sisters?! 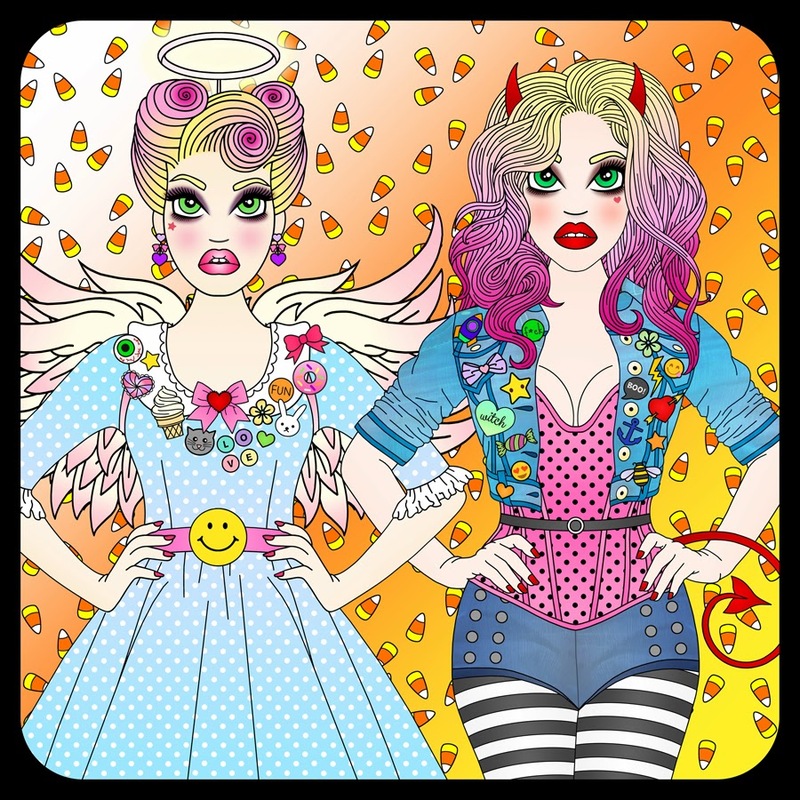 I'm not sure, but they were fun to draw + colour and add in all the colourful brooches and badges on their outfits. What do you think? you can't really tell it from the photo but it's a pretty sizeable board! It felt good to work on a larger board again, although this time it was 2x4 foot instead of the 2x6 foot boards I worked on in quadruplicate for my Degree show last Summer. 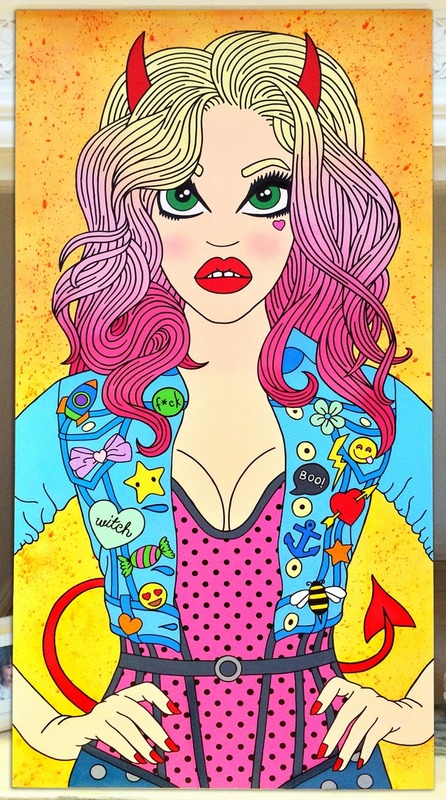 In case you're wondering, I haven't decided whether or not to paint 'Treat' as well. I suppose it makes sense painting them both (and I do have another board this size, primed and waiting to be painted on!) but i'm not sure if i'll paint her or something else instead. so I think that's it for today, I can't really think of anything else to tell you. Despite the massive gap i've left between blog posts since last time, nothing has really happened worth mentioning.